HERSHEY - York Catholic didn’t have an answer for the Camp Hill Lions during Thursday night’s District 3 Class AA championship game. More specifically, the Fighting Irish couldn't stop Camp Hill’s Leah Springer. She hit her shots from close range, from outside the arc and from the foul line, and she picked up rebounds. The senior forward scored 31 points as the Lions defeated the Fighting Irish, 54-40, ending Catholic's streak of 10 consecutive district titles. 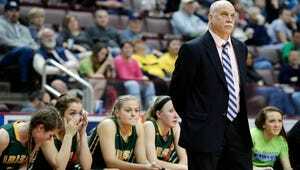 “She played great,” York Catholic head coach Kevin Bankos said of Springer’s performance. “We knew that coming into the game that she was that good, but one kid doesn’t win the game. They have a bunch of role players that did a lot of those things and hit a couple 3s. Thursday's game was a rematch of last year’s district championship, when the Irish defeated the Lions, 63-57. This time, the two sides spent much of the first quarter and a half trading baskets before Camp Hill started to pull away. After Kate Bauhof hit her ninth point of the game, the Lions began to roll. Bauhof’s basket tied the game at 18 for York Catholic, but Camp Hill went on a 10-4 run to head into halftime with a 28-20 lead. The Fighting Irish mounted a comeback in the third quarter with Bauhof leading the way. She opened up the second-half scoring with a 3-pointer and proceeded to put up seven more points, cutting the deficit to four. That was the closest the Irish would come. The Irish shooters cooled off, and the Lions put their foot on the pedal. Camp Hill put up 17 fourth-quarter points to dethrone the Irish. “We had an opportunity to get a steal,” Bankos said about the third-quarter comeback. “We got a steal, made a move to the basket and it just didn’t go in. They got the rebound. Rebounding was one of the keys to the game, and I don’t think we won the rebounding battle, obviously. The Irish were outrebounded 18-15 along the offensive boards and 33-25 defensively. Still, Bankos was positive after the game. Desseyn 0 0-0 0, Katie Bauhof 9 5-6 26, Wright 2 2-2 6, Laslo 0 0-0 0, Rader 0 0-0 0, Reed 0 1-2 1, Brier 0 0-0 0 Sterner 1 0-0 2, Strayer 0 0-0 0, Citrone 1 2-2 5. Totals — 13 10-12 40. Stevens 2 0-0 6, Murray 0 0-0 0, Thompson 1 0-2 2, D. Bragg 3 1-4 7, Leah Springer 6 16-18 31, Johnson 1 0-0 2, P. Bragg 1 1-4 3, Collingsworth 0 0-0 0, Reid 0 0-0 0, Hepfer 1 1-2 3. Totals — 15 18-24 54. 3-point goals — YC 4 (Bauhof 3, Citrone), OV 6(Springer 3, Stevens 2, P. Bragg).